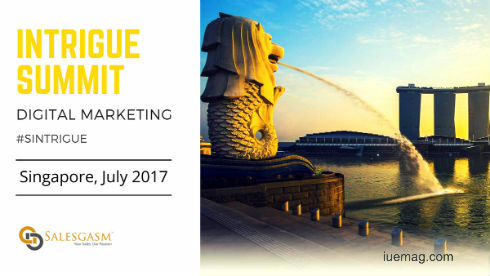 Digital Marketing Buyers and Suppliers Meet on 26-27 July 2017 at Singapore. Join us at the Intrigue Summit. The city is all set to hostthe digital marketing/advertising buyers and suppliers rendezvous on 26th and 27th July 2017. The meet-up will take place at Quality Hotel Marlowin an upcoming Intrigue digital marketing Summit organized by Salesgasm. It will have the digital marketing professionals from some of the top-notch organizations in the world. The event will also be attended by few of the finest speakers from Singapore and the APAC region with an intriguing agenda covering the latest in marketing and advertising technologies. On both the days of the conference, there will be registrations and intriguing keynote sessions on the hot topics of digital marketing domain. Some of thekey topics are SEO, Content Marketing, Tips and Tricks to Boost Sales with digital platforms, a session on branding, designing, etc. Laura Kantor (Head of Marketing at Foodpanda), Mandy Ang (Global Social Media Lead at Oracle), Alexandra Snaider (Head of Marketing and Communications, Asia South at Nokia), Boris Bataille (Head of Online Marketing at Zen Rooms), Dina Ho (Head of Digital Marketing at Mc Graw Hill), Rajiv Singh Sawhney (Head Asia Pacific: Strategic Partnerships, Media, Content Acquisition and Business Development at Yahoo!) etc. 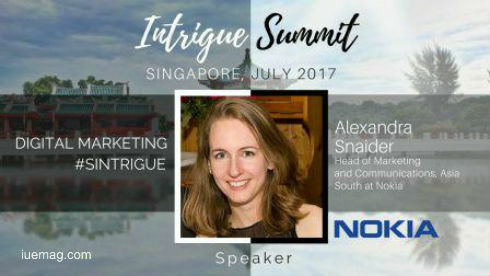 are some of the confirmed speakers at Singapore Intrigue Summit. Tea and lunch breaks on both days of the summit are sure to build an unparalleled networking atmosphere for all the attendees of the digital marketing summit. The digital marketing conference organized by Salesgasm promises to enlighten the delegates with powerful content that is trending in digital marketing niche. Further, the attendees will get to see, experience and understand the latest, fastest, most effective and safe marketing products and services showcased by the exhibitors. The gold sponsors of the Intrigue Summit are Webeasts, Venuerific and Studionv, while The French Cellar is the wine sponsor. The silver sponsor bucket has prominent names such as Ek Doo Teen, Analyzen and Neyox. 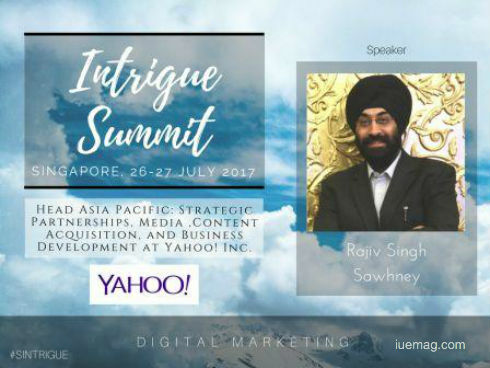 The official news release distribution partner of digital marketing Intrigue Summit is PR Newswire while the Media Partners list boasts of eminent organizations such as Blogs Release, App Futura, Mobile Firms, Crowd Reviews, CMS Wire, F6S, TheTechPortal.com, MediaBuzz, Research and Markets, and iUeMagazine. Salesgasm is a professional sales and marketing training facilitation company that organizes world class conferences and expos across the globe focused on Sales and Marketing attracting the finest professionals and bringing them together under one roof to get educated, network and generate business. Some of its last marketing conferences were held at New York, New Delhi, Sydney, HongKong, etc. Other upcoming Intrigue Summits of Salesgasm will be held in Sydney (Sep 2017), London (Oct 2017), Hong Kong (Nov 2017), and Los Angeles (Dec 2017). The iUeMagazine team is delighted to work with Salesgasm as Online Media Partners & is expected to bring Unlimited Inspiration for all readers from there upcoming events. Staying tuned to the enriching updates from these events is recommended. Any facts, figures or references stated here are made by the author & don't reflect the endorsement of iU at all times unless otherwise drafted by official staff at iU. This article was first published here on 1st July 2017.